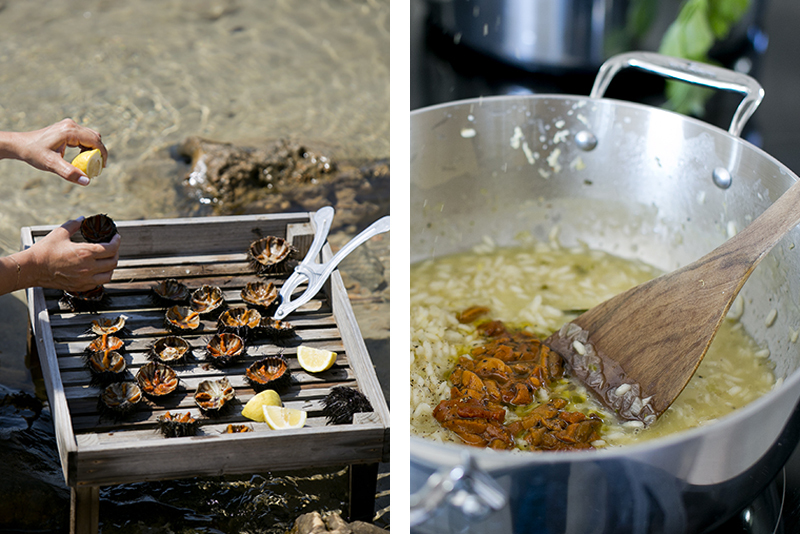 This is the basic ingredient for the perfect summer risotto, one you can only create if you are right by the sea. 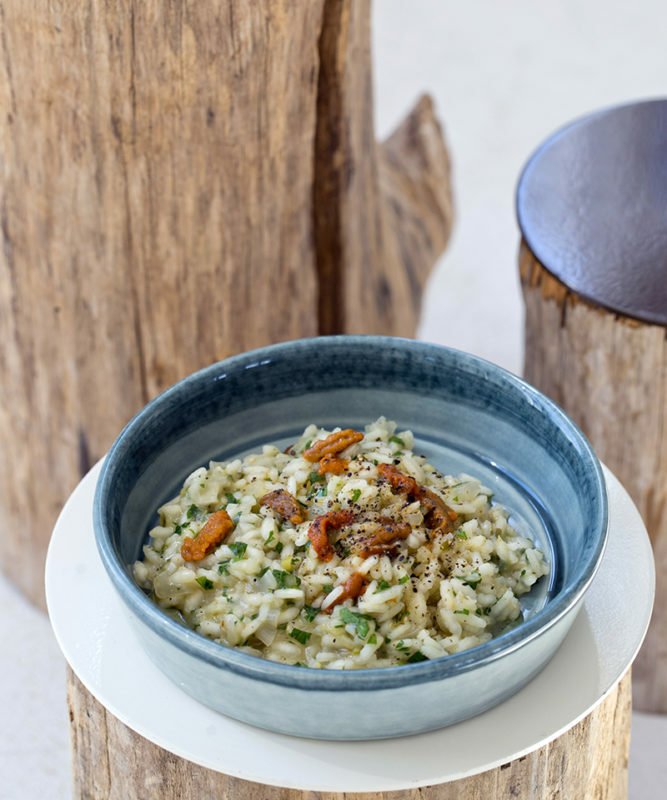 A clear taste of the sea aura with carnaroli rice and herbs embracing the tender and juicy roe. 1. In a big pot, add the vegetable stock, water, wine, onions, thyme sprig and bay leaves. Bring to a boil over a medium-low heat and simmer, approximately 30 minutes. Turn off the heat and strain the stock. 2. 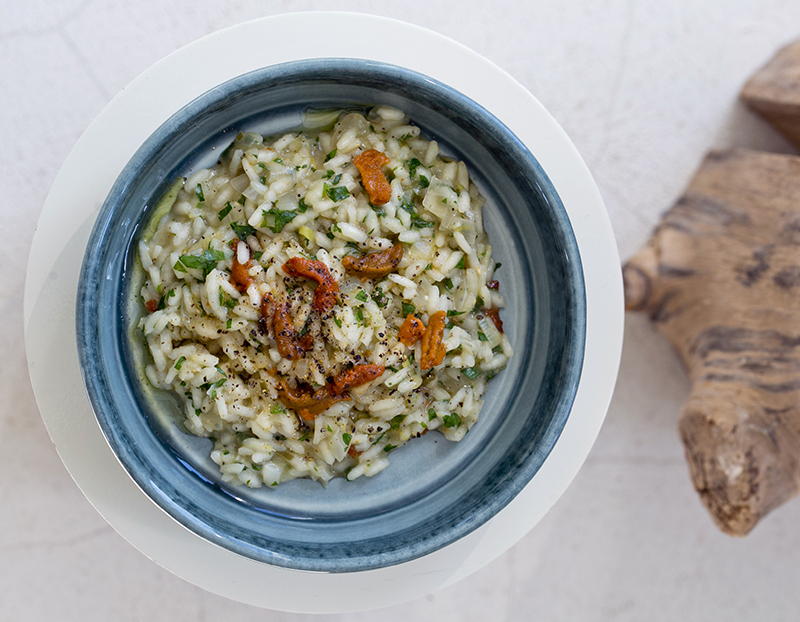 For the risotto: Heat 2 tablespoons of the oil in a heavy casserole over a medium-high heat. Stir in the garlic but remove it as soon as it begins to colour. Add the rice to coat the grains, and sauté for 2 to 3 minutes. As soon as the rice is shiny, add 1 cup stock and cook at a medium simmer, stirring constantly and allowing each addition be absorbed before adding the next. Continue until the rice is tender and creamy-looking but still al dente, 20 to 25 minutes. Remove from the heat and stir in the sea urchin roe and the remainder of the olive oil. Keep a couple of spoonfuls of the roe aside for garnishing.